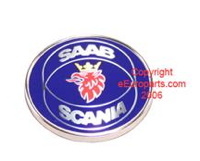 Seeking a SAAB painted logo emblem for rear of 1987 SAAB 900 3 door hatchback, part # 6941264. Want to buy: 900 SPG in Talladega Red or Beryl Green. Looking for a well sorted, rust-free original or restored car. No projects. East coast preferred. I'm looking for a set of original alloy Tri Quad (Gary Fisher) wheels for my 2000 Saab 9-5 Gary Fisher Limited Edition. Thanks. Need OEM hatch rear window for 1993 900 Commemorative (the glass with defroster grid). Prefer NOS or as close as we can get. Someone took batting practice out on mine. Price, shipping to 95128 & condition please. Thanks. Seeking parts for 1970 95 Wagon, tail lights , lenses, dash pad, interior parts prefer new but will look at like new. Have many new 900 turbo parts for trade if interested. Otherwise purchase ok. Need a 1999 9-3 Viggen Owner's Manual Packet. I believe this is a regular 9-3 packet with a supplement for the Viggen. Also looking for NG 900/9-3 cargo shelf organizer and trunk caddy/storage box.